iPhones and iPads may get the attention these days, but Apple isn't ready to abandon its iconic music players just yet. The company announced two new iPods at its Wednesday media event—updated versions of the iPod touch and the iPod nano. The new fifth-generation iPod touch is thinner than its predecessor (6.1mm vs. 7.2mm) and lighter (88 grams vs. 101). For the first time, the touch’s case comes in colors (silver black, blue, yellow, and red). There’s a new iPod touch loop: Push it and it pops up, and you can then attach a wrist strap. The new touch’s screen is not only bigger—4 inches diagonally vs. 3.5 before—but it’s also a sharper Retina display; it is, in fact, the same screen as on the iPhone 5. Inside, the fifth-gen iPod touch has a dual-core A5 processor that Apple claims is up to twice as powerful as the previous model’s CPU; the graphics guts have been updated as well. The new touch has a much improved camera. It comes with a 5-megapixel sensor and supports 1080p HD video recording. It has autofocus and LED flash for the first time; Apple also claims that the camera’s autoexposure is much improved. Like the iPhone 5, the touch has a sapphire crystal lens cover, and like the iPhone 5, the touch supports a new automated panorama feature, for taking wide shots. Apple claims the new touch’s battery will last for 40 hours of music playback and up to 8 hours of video playback—not much different from the previous generation. The wireless capabilities have been improved, too, with support for Bluetooth 4.0 and dual-band 802.11n networking. Like the iPhone 5, the touch comes with the new Lightning connector, as well as the new Appel EarPods headphones. Naturally, the new touch will run iOS 6, so you’ll get Facebook integration, iMessage, AirPlay Mirroring, and all that goodness, too. And the touch now supports Siri, the digital assistant first introduced with the iPhone 4S. The new nano is in some ways a throwback: Video is back, and it has a bigger screen. That display is a 2.5-inch Multi-Touch screen, the largest display ever built into a nano; it supports widescreen video. It adds a bunch of navigation buttons: There’s a home button now, which gets you get back to your home screen quickly; and it has buttons for controlling volume and for playing, pausing, and changing songs. Like the touch, the new nano is thinner than its predecessor (5.4mm vs 8.78 mm). It, too, comes in a range of colors (white, black, purple, green, blue, yellow, and red/pink). Apple claims battery life is better on the nano, too: Up to 30 hours of music playback, vs. the last generation’s 24. And the nano also now supports Bluetooth, for wireless streaming to speakers, headphones, and car systems. And the nano also comes with the new Lightning connector and the new Apple EarPods. Apple will start taking pre-orders for the new iPod touch at the Apple Store (www.apple.com) starting September 14; the touch will start shipping in October. The 32GB model will have a suggested price of $299, the 64GB model will run $399. 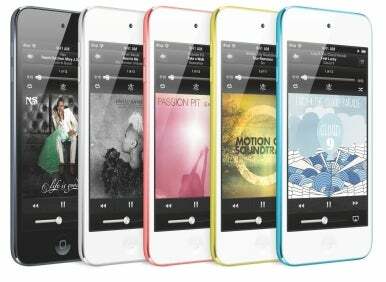 The previous fourth-generation iPod touch will still be available, as well, for $199 (16GB) and $249 (32GB). Owners of the fourth-generation touch will be able to install iOS 6 as a free software update when it ships Sept. 19, though they may not be able to take advantage of all of its features. 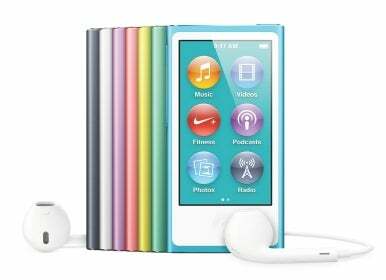 The iPod nano will also be available in October, with suggested pricing of $149 for a 16GB model. Apple didn't mention either its low-end iPod shuffle or its legacy iPod classic during Wednesday’s press event, though both remain available in the Apple Store alongside the newly announced music players. The 2GB shuffle continues to be available for $49 while the 160GB classic remains priced at $249. On Wednesday, Apple announced a major update to its iTunes software, set to appear in October.